Ideally stairs should be constructed in South. West or South-west corners to gain good wealth and for inmates health. However, stairs in other corners lead to loss of wealth. Stairs should be constructed clock i.e. clock wise and anti-clockwise stairs should be avoided. Number of stairs should not be even numbers or zero at unit place such as 10, 20, 30; stairs are good in odd number for instance 3, 9, 11, 13 etc. Avoid stairs in Brahmsthan- Centre of the house which is inauspicious. Main stair should never originate from strong room, kitchen and pooja room. Circular stairs should also be avoided. 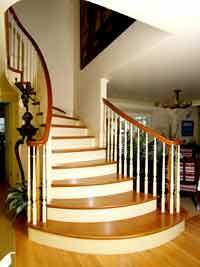 Stairs arising from South, West or South-west are auspicious and beneficial in terms of financial gain. The starting stair should not be round. Unruly and bad conditioned stairs create mental instability and stress among inmates. Thus stairs should be kept in good condition through repair. Room having staircase in South-west direction is not good for occupant and lead to problems like hypertension, anemia and other complicated disease which are sometimes incurable.